Elections can have grave consequences. Shall I say, beer purchases can, as well? During the recent political season and presidential election, I remained (almost) neutral at this blog, a beer blog, after all. But after the events of the past three weeks, the short period following Donald Trump's inauguration, I, in good conscience as a loyal American, cannot remain neutral. ... Considering all of that and more, and understanding the historical Constitutional gravity of this, I, as a loyal American can no longer support or honor Donald J. Trump as president of the United States. I call for his removal from office, either by House impeachment and Senate conviction or by Cabinet invocation of the 25th Amendment, with all deliberate speed. To that end and until that time, it is imperative and just to protect and defend the Constitution of the United States of America and to protect and defend those who suffer by President Trump's willful and malicious abrogations of it. to defend and preserve the individual rights and liberties guaranteed to every person in this country by the Constitution and laws of the United States. 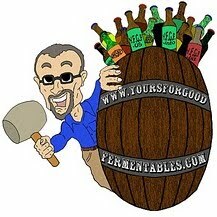 Allying that and my mission of good-beer, the thing of this blog, I have been and will be donating $1.00 for any beer* I order, throughout the month of February, in any pub or restaurant or taproom or brewery that I visit. A puny thing versus the terrible might that President Trump can wield, but when enough patriotic (beer-drinking) Americans resist, good can result. And there are so many women and men, who are braver and smarter than I, doing so much more. Even in this #DrinkForGood campaign, I don't drink alone. Yes, by dumping Trump, Vice President Mike Pence would gain executive power. Yes, he and Senator Ted Cruz and their ilk often do demonstrate odious ideologies. But they are (and, I would hope, would continue to be) competent men, temperamentally sound, and respectful of American law, American political traditions, and the American Constitution. We, the loyal opposition, can fight them through normal American political methods. Strong opinions will, by their vigor, be met with strong consequences. Disagree with me? Don't read me. I am under no illusion that my words here will change opinions, many or any. But I will continue to exercise my constitutional right to free speech ... while I can. Not Drunk-Against-Trump, but #DrinkForGood to #DumpTrump. * Wine, cider, whiskey, and other spirits are in this campaign as well. It would be foolish to fail to enlist them and their advocates. Website for the ACLU: aclu.org. More about others who will #DrinkForGood, at DRAFT. On Twitter, at #DrinkForGood. 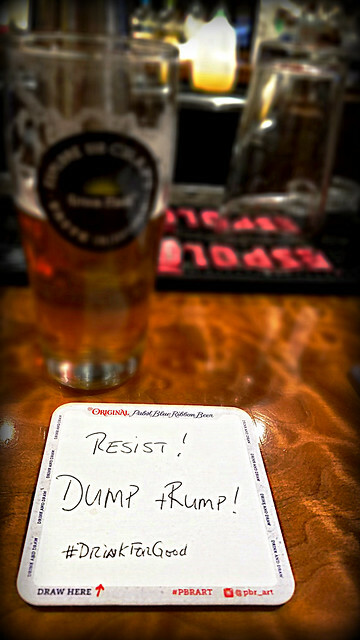 Should brewers engage in political discourse? 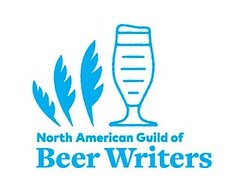 Beer writer Alan McLeod thinks they should, if for business reasons. Beer writer Bryan D. Roth writes somewhat the same thing. Respected wine writer Steve Heimoff has not been shy about his politics.